I read this article in RECORD 3/4 with great interest as in February 1946 I saw certain of these locomotives in the Freetown area. At that time only 43, 44 and 47 were in service, and these were employed on shunting duties and on working traffic - usually a couple of bogie vans at a time - up the steep incline from the jetty towards Water St. (The photograph shows 47 on this duty on 21st February 1946.) I was told that 45 and 46 were lying awaiting scrap at a point up the line but I did not see them. The earlier engines of this class did not enjoy a long life. Some of the 21−27 batch were laid aside by 1912 and all officially withdrawn during 1921. The first of the 28−36 batch to go was 29 KUTUBTJ in 1925, but 34 FABUNDEH lasted until August 1941. SLGR records showed that all these carried names except 30 and 35, but there appeared to have been some transferring of names between individual engines. The 38−47 batch were not named, and withdrawal of these commenced in 1940; probably only the post-War built engines are now running. When first seeing these little engines I was immediately struck by their superficial resemblance to RUSSELL. The unique 0−4−0T by Warm of St. Vaast (page 70), scrapped in November 1962, was not so unique after all! 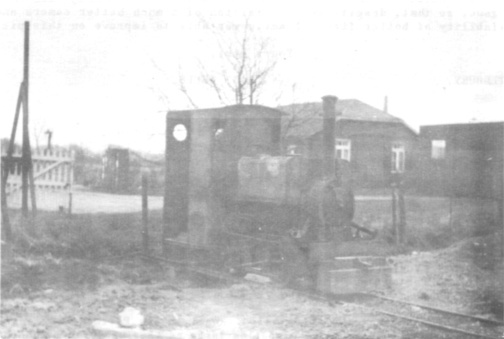 A further similar machine has recently been discovered by several members at the Sucrerie de Rang du Fliers, Pas de Calais, and it has been established that there were originally at least four of these 0−4−0T's in service with the Mines d'Anzin as their nos. 4 - 7. The actual builder is uncertain as "Compagnie d‘Anzint" is often quoted. The name "Warin" was recorded in the log-book of the loco I saw at the Produits Chimiques et Angrais d‘Auby, and St. Waast is the location of the workshops of the Valenciennes Groupe of the Houillères Nationales who took over the Mines d‘Anzin. Three at least (possibly four) of these locos were sold out. of service in the 1930‘s, but the H.N. say that their records for this period have long since disappeared and that they are unable to help. Information now to hand shows that the Baldwin fireless locomotives at Homecourt were scrapped in June 1963, whilst at Hauts Fourneaux de la Chiers there was no sign of activity on the narrow gauge system in July 1963 and the loco shed was empty. The narrow gauge system at Villerupt appeared to be out of use in July 1963 and only two derelict locomotives were noted. The Carrières des Malavaux at Cusset are converting to standard gauge and the new line is probably now in use. Most, if not all, of the Corpet Louvets at the Sucrerie de Montcornet have ceased work and been replaced by diesels. The St. Denis gasworks is now entirely diesel operated. There are two errors in the caption to the lower photograph on page 69. "(Heische)" and "Chiere" should read "(Henschel" and "Chiers" respectively. On page 70 there should be no gap after line 24 and "3050" on line 25 should he deleted. Incidentally the article should commence with the penultimate paragraph on page 70 and continue to line 46 on page 74; the introductory paragraphs on pages 67 to 70 should then be inserted before line 47 on page 74. The concluding paragraph of my article, which was omitted, is reproduced below. I first saw HAIG early in 1945, when I was in the Army stationed at a R.E.M.E. camp near Hemel Hempstead (at a place that rejoices in the name of "Cupid Green"!) and used to spend a lot of time riding about the countryside in the cab of a lorry. I probably saw HAIG for the first time on 26 March 1945, but it was mot until later that I was able to approach it on foot. The picture was taken on a very dull afternoon on Sunday, 18 November 1945, on a very slow film. I agree that it is not a very good one, but it is the best I have. In fact it is the ONLY one I have. As I remember it, HAIG stood on an isolated piece of track on the west side of the A5 road, north of Dunstable. The nearest place on the 1" O.S. map is Potsgrove. I had spotted it from lorry cabs several times, but being on duty I was unable to investigate. During the weekend 17/18 November 1945, being off duty, I was "exploring" the network of narrow gauge lines that used to be found in the Leighton Buzzard area, and had long thought that HAIG belonged to this system. However, on-the-spot inquiries showed that this was not so. Writing from memory, I seem to recall that either the land on which HAIG stood, or the buildings on the next plot (seen in the picture) had something to do with road transport - a garage or filling station. This was the last time that I saw HAIG. My days of touring the countryside at the Army‘s expense had already ended, and my duties kept me in the immediate neighbourhood of Hemel Hempstead until I was demobbed at the end of January 1946. I did not travel on the A5 again until the summer of 1952 but by this time HAIG had gone, so that, despite the acquisition of a much better camera and the availability of better films, I was never able to improve on this picture. I was rather disturbed to read on page 23 (RECORD No.2) that RUSSELL, in its original condition, was too large to work over the Welsh Highland Railway extension to Portmadoc. This is a mistaken assumption which I feel ought to be corrected. The facts are that the Aberglaslyn tunnel on the Portmadoc extension was constructed to a loading gauge almost as large as that used for standard gauge railways and hence presented no obstacle. RUSSELL in fact was cut down to enable it to work through the Festiniog Railway’s small-bore Moelwyn tunnel, the intention being to use it on through workings to Blaenau Ffestiniog. Unfortunately, even after the butchery, RUSSELL was still that little bit too large, and in the interests of safety the idea was abandoned after one hair-raising, side-scraping journey. Surviving records show that the cutting-down was performed at Boston Lodge. Had RUSSELL been unable to negotiate the Abergiaslym, the work would have been performed at Dinas or Beddgelert, no doubt. I received RECORD No.3 which was very good and well produced. You quote me as "in exile" but it is not unwelcome. So far as railways go South Africa has very few very old industrials, but plenty of interest. Distances between places are considerable as you can tell by the 1,350 miles I covered in four days on a trip to Natal. A car is absolutely necessary to get around as public transport is hopeless. Per square mile I imagine that there are still more steam industrials in Britain, and they are much more easy to reach. A friend commented on the rattly doors on my car the other day, but he didn’t know that I had been down quite a few dirt roads to obscure collieries! You have to go fast to even out the bumps and it‘s alright if it’s dry, but I couldn‘t help thinking it was mad to be going at 60 over such a poor surface! As the natives let their livestock run loose and with few fenced fields as in England there are additional hazards on the road; on rail, too, for when I was at the Rustenburg Platinum Mines the loco foreman was rather annoyed at the number of donkeys wandering about all over the track! We have two sidings to serve our two jobsites over here, and both are shunted by SASOL with their two Esslingen diesels. We feel we might get held up if big loads come in, but our Superintendent has gone on record as saying we can‘t afford our own loco. Pity! Apart from SASOL, Fisons next door have two diesels - a Hudswell Clarke and a Hunslet-Taylor. The next nearest place is Coalbrook Colliery with one 2−8−4T and two 4−8−2T. Then there are a few locos in Vereeniging about twelve miles away. The oil refinery has its own colliery and produces oil from coal. It is to sink a further mine to provide fuel for our additional plant, and others are planned; these will have no rail connections, coal coming by conveyor belt to the plant. Similarly the power stations here are built adjacent to collieries and take their supplies of coal by conveyors. Their scenic features are the ash tips that make them look like collieries! There seem to be a lot of level crossings on what industrial lines I have seen, and it should be possible to see most locos when they are working. My sight of SAR locos has been brief, and in any case the Reef area (and Sasolburg) is electrified. The brake vans are unusual in seeming to be converted carriages, and passenger accommodation in these is available on all goods trains (provided they stop where you want to get off!). You will be interested to hear that the 4−4−0's mentioned in RECORD No.2 (page 43) are still around. The citrus estate line has gone, but a firm in Johannesburg (Dryden Engineering) had the locos - three 4−4−0's (as per photo) and a Hunslet 0−6−0T (with tender). Two of the former are collecting rust and dirt. If you want one, the asking price is £500 and I will arrange shipment at your cost! They are quite nice little locos, and I took a look at them yesterday. The third was donated to the Rand Society of Model Engineers, and is now on permanent display outside their pavilion at Milner Park, Johannesburg. (It has appeared in advertisements for boys’ clothes in the National Press!) Milner Park is where the annual Rand Show is held, and when I went along the 4−4−0 looked to be in pretty good condition. The only other engine at the Show (not counting those on the miniature railway) was a 4−wheel diesel for under ground use built by Hunslet-Taylor, a firm which recently celebrated its 1,000th locomotive. An overhead passenger ropeway built for the Show traffic closed temporarily following an accident when one of the cars fell off the rope. The Show is a peculiar mixture of agricultural, retail and trade shows, with the gold mines exhibiting a pile of gold worth £2,100,000 and the diamond mines a similarly valuable exhibit. Diesels are coming in - recently the evening paper featured a Dorman Long/GEC double-bogie locomotive as the biggest diesel-electric built in South Africa. It was for Northern Lime Co. Ltd. at Tuang, one of the inaccessible places and miles from anywhere. Kimberley diamond mines are quite a long way from here also, but worth a visit if possible as they have a massive 18 in. gauge Bagnall steam loco preserved, and others reported derelict. So if the Bicton Woodland Railway likes to think about importing some, I will investigate the possibilities! WOOLWICH is pretty hefty, but a photo I‘ve seen suggests that these are even more bulky! One of my more interesting discoveries here was at an obviously little used line where a rickety old shed had contained only oil drums on my first visit. Calling on the off chance a second time I saw in the back of the shed what looked like a steam loco. It was! A little Avonside! A native appeared briefly but disappeared before I could question him - discovered later dozing in the sun - and I had to visit a deserted office to find out who the owners were (Sir J.L. Hulett & Sons Ltd., de Jagers tramway). To sum up, there are at present about 645 (360 steam, 240 diesel and 45 electric) industrial locomotives in the whole of South Africa, Bowaters at Sittingbourne, Kent, have more big narrow gauge steam than most plantations, but no atmosphere in comparison. I am planning trips for my holiday at the end of this job. Two places I‘m considering are Mauritius and Reunion. Actually I need a co−driver. Is anyone interested? The articles in RECORD No.3 were most interesting and there are a few comments I would like to make. Heston Airport Gravel Pits (page 55) were not opened in 1942 as the Airport was still in use as an RAF Station during the War. The pits started up soon after the War was over, possibly in 1949 when these rebuilt wagons and the three new Rustons arrived, I first saw WD 3239 (page 82) at Longmoor in November 1945, but it is shown in the RCTS Locomotive Stock Book Appendix for 1938 as being there then. Through a friend, Mr. V.S. Haram, I have seen your RECORD No.2 and found this very interesting. I was particularly interested by the letter from N. Fields of Cheadle who recorded his visit to the Zebediela Citrus Estates in the Transvaal in October 1941 when he saw some of the ex−S.A.R. "Lawleys" at work. I am a retired Rhodesia Railway officer and have been for some time delving into the past for information concerning the original narrow gauge (2 ft. Beira Railway which was constructed in 1895-1897 and converted to 3 ft. 6 in. in 1900. The line was one of the schemes of Cecil Rhodes to open up Rhodesia and was built at the same time as the 3 ft. 6 in. gauge line from the Cape was making its way up through Bechuanaland into Rhodesia to Bulawayo (1897) and then on to Gwelo and Salisbury (1902) to link with the 3 ft. 6 in. line built from Imtali to Salisbury before the Beira line was widened to the same gauge. Due to various reasons there is very little on record as to the rolling stock of the original Beira Railway but it is quite definite that the S.A.R. class NG 6, known as the "Lawleys", was a batch of 4−4−0 tender locos built by the Falcon Engine & Car Works, Loughborough, for the Beira line. 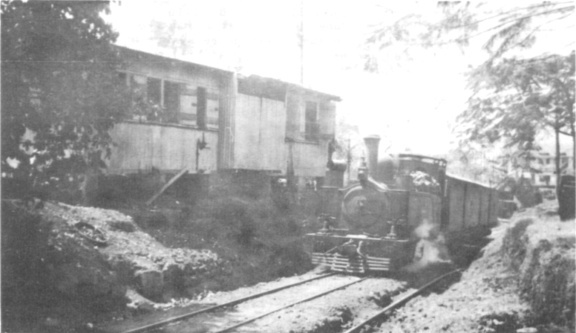 In 1900, when the narrow gauge was closed down, all the rolling stock was concentrated at Vila Machado, about sixty miles from Beira. In 1902 a branch line from Salisbury to the Ayrshire Gold Mine was opened on 2 ft. gauge and a number of the Falcon 4−4−0's were used on this. line until it, in turn, was converted to 3 ft. 6 in. gauge in 1912. After that the 4−4−0's were dispersed among various private concerns. In 1915 the S.A.R. were short of loco power, partly due to taking over German South-West Africa, which had 2 ft. gauge lines, and thirteen Falcons, ex−Beira Railway, were bought from Mr. Lawley who was a partner with George Pauling, the famous railway contractor. Four of the thirteen Falcons were used for spare parts but the other nine became "Lawleys" and were used for varying periods by the S.A.R. on their narrow gauge lines in the Cape and Natal as well as in South-West Africa. Of the nine, one was scrapped by the S.A.R. and the other eight were sold. Three went to the Zebediela Citrus Estates in 1929-1930, and continued to give good service there until about 1960 when the Estates went over to road transport for their internal citrus collection to their packing sheds. In 1958 I saw these Falcons in steam at Zebediela, together with a small shunting tank engine built by Hunslet. As regards the locomotive stock of the original Beira Railway it is definite that there were two types of Falcon 4−4−0 engines, as I have acquired a number of early photographs through the Rhodesian Archives. (The early records of the Falcon Company, I am told by the Brush Electrical Engineering Co., were unfortunately destroyed) The main differences between the two types were that the smaller earlier version had a 4−wheel tender, inverted cone-shaped spark arrester chimney, and a straight running board. The later and somewhat larger version had a 6−wheel tender, a longer smokebox, a longer straight chimney, and the running board was stepped down at the front of the cab. It was the later type that formed the "Lawleys" though one of these had the straight running board. The Beira Railway apparently had forty-five narrow gauge locos, but how many there were of each type I have not yet found out. I have mentioned above that the Beira Falcons - or at least some of them - were used on the Ayrshire line in 1902-1912. In addition, a single 2−4−0 with a 6−wheel tender was imported from Germany, apparently specially for it was named HANS SAUER after the mining magnate Dr. Hans Sauer who was connected with the Ayrshire Gold Mine. This little narrow gauge loco was slightly more powerful, hauling a maximum of 72 tons against the Falcon‘s 42, and it had outside Walschaerts gear while the Falcons had inside Stephenson motion. I have only recently managed to trace and obtain a photograph, but the makers plate is obscured so that I have not yet established who built it. HANS SAUER had a brightly polished dome and a round sandbox between dome and chimney. Of the other Beira Falcons I have traced some on various Rhodesian industrial railways - cement works, gold mines, timber estates, chrome mines - while at least two are still in use on a sugar estate near Beira, Moçambique. If any of your members care to correspond with me on this subject I shall be happy to reply. My address is: 6 Mountain View, Beach Road, FISH HOEK, Cape, South Africa. (In their early days, as is well known, Kerr Stuart were dealers and not builders. They handled the sales of locos built by Hartley, Arnoux & Fanning of Stoke-on-Trent (whom they acquired) as well as those of Fowler and Falcon/ Brush. I was therefore not unduly surprised to find that Kerr Stuart‘s Order Book shows five 2 ft. gauge Brush locos (two 7" and three 8" by 15") booked out to Geo. Pauling & Co., Beira, on 25 July 1892 (order date ?) with progressive numbers 572 to 576. There are no records of further loco shipments to Beira, but on 2 February 1910 Kerr Stuart shipped out to "A.L.L., Beira" parts for converting two 8½ by 15" locos into stationary pumping engines. According to the "Industrial Locomotives of Southern Africa", published in two parts - price 10/- each - by Union Publications, 30 Scarsdale Villas, London, W.8, the identified industrial "Lawleys" are as under. None has been noted with builders‘ plates, and the S.A.R. plate is carried on the tender. S.A.R. NG 96 Premier Portland Cement Co. Ltd., near Bulawayo. 97 Zebediela; now in Dryden Engineering yard, Johannesburg. 98 Zebediela; now in Milner Park, Johannesburg. 102 Van Ryn Gold Mining Estates Ltd., Benoni. 105 Selukwe Peak Light Railway; to Rhodesian Timbers Ltd., Igusi; now preserved in Umtali Museum. 106 Zebediela; now in Dryden Engineering yard, Johannesburg.